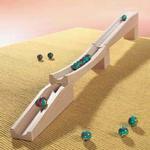 With the Haba Impulse Track it`s interesting to see how the incoming marbles pass energy on to the stationary marbels. Cleverly designed and made in Germany by HABA, the Impulse Track Accessory Set makes a delightful addition to HABA's Ball Track Construction System. Made of untreated beechwood, this wonderful set is meticulously crafted to withstand generations of play! 1 impulse track, 2 ramps, 1 support block and 12 marbles.